The Volkswagen Passat Estate really brings the goods in its eighth-generation guise. It's slightly shorter, but the longer wheelbase means more space for passengers and cleverer packaging ups the luggage capacity from 603 to 650-litres with all the seats in place. UK buyers get a predominantly diesel line-up, with a 240PS all-wheel drive flagship. Utility is a surprisingly hard sell. Yes, we tend to aspire to the sort of utility we don't actually need, which is why we hanker after sports watches that can submerge to the bottom of the Mariana Trench, Arctic-spec down jackets to withstand a snow flurry in Surrey and, yes, sports utility vehicles that could cross the Darien Gap when all we really need them for is to bump over a parking kerb outside Starbucks. Genuine utility isn't quite so aspirational. Seats that you can clean a baby's worst efforts from, room in the back for a bookcase from IKEA, metronomic reliability; it's what people need but not what draws people into showrooms looking for a dotted line to sign. That's the size of the challenge facing Volkswagen's current generation Passat Estate, a car that does utility utterly brilliantly. The eighth generation Passat has sharpened up its game quite significantly and those changes are most apparent in the way the chassis and suspension combine to improve cabin refinement. The longer wheelbase has certainly helped in this regard, giving the Passat a more assured feel on the road and the stiffness of the MQB chassis lets the suspension soak up surface imperfections without having to devote resource to managing chassis flex. There's been real attention to detail in the quest for refinement. The engine is mounted on a rigid steel structure that's is claimed to further dampen vibration which, when combined with a lot of analysis of the acoustic qualities of the engine bay materials and shape, has cut engine noise significantly. Under the bonnet, there's a choice of either a six-speed manual gearbox or a seven-speed dual clutch DSG and a wide range of engines. The range opens with 125 and 150PS versions of Volkswagen's 1.4 TSI petrol unit and a 120PS 1.6-litre TDI diesel powerplant, but Volkswagen's volume seller is the 2.0-litre TDI unit with 150PS. There's a high output 190PS version of this engine offered, while at the top of the range is a 240PS 2.0-litre BiTDI engine with twin turbos. If you need some modicom of off road capability, then you might want to consider the 'Alltrack' version, which mates the 150PS and 190PS 2.0 TDI engines with a higher ride height and 4MOTION all-wheel drive. Alternatively, there's a petrol electric plug-in hybrid GTE version. Although the wheelbase has grown by 79mm and the car looks bigger than before, the tape measure doesn't lie. This Passat Estate is actually a little shorter than before. It's lower too, although a few millimetres of extra width don't hurt. All-out carrying capacity has improved though. There's an extra 47-litres with the split/fold rear seats in place, with an impressive 650-litres on offer. Fold the seats down and that extends to a huge 1,780-litres. Big storage bins in the doors and centre console add everyday utility to the cabin. The dashboard is a good deal more angular than before, although Volkswagen would probably call it 'architectural' and now features a big central screen and a set of optional digital 'virtual' dials. The seats, as in most Volkswagens, initially feel unyielding but are supremely comfortable over longer distances. Three adults can fit in the back too. Materials quality in the cabin is markedly improved, the Passat now edging closer to premium German marques like Mercedes and BMW. The estate models add another £1,500 to the prices of the saloons, so that means you'll need to find just under £24,000 for the entry-level 1.4-litre TSI petrol model in S trim, with the DSG 'box adding another £1,600. You'll need a budget of around £26,000 for the 120PS 1.6-litre TDI diesel which offers a six-speed manual in standard form. The 2.0 TDI 150PS unit many want starts from just under £27,000. You'll need to ascend to the GT trim level to get access to the high-power 190PS diesel engine, and that'll set you back nearly £31,000. The big banger of the range is the all-wheel drive 240PS model and this also starts at GT level, costing over £38,000 with the DSG shift. Alternatively you can pay another £1,000 for R-Line specification and a seven rather than six-speed 'box. The range runs through S, SE, SE Business, GT and R-Line trims. Avoid entry-level spec and you get LED headlights and all Passat models now get the brand's 'App-Connect' smartphone-mirroring system. Safety provision is strong too, with all variants featuring equipment such as a Post-Collision Braking System and Front Assist autonomous braking. Other common Passat features include Adaptive Cruise Control, a Pre-Crash system, Driver Profile Selection, Ergo Comfort seats and front and rear parking sensors. The brand's 'Discover Navigation' package is fitted on the 'SE Business' variants aimed at fleet drivers. Heated Alcantara seats, three-zone climate control and 18-inch wheels are standard on the GT, while the range-topping R-Line adds seems to empty the rest of the options list into the car. A BlueMotion eco version and an Alltrack estate with 4WD are also being imported, as is a GTE Plug-in Hybrid version. The Passat Estate is a car that sells on pragmatism, so it's a critical component of its success that the running costs of the vehicle flag up all the right numbers. Remember that despite its increasingly urbane appeal, the bulk of this car's sales will still come from fleet buyers who don't give a brass tuppence about soft-touch dashboards, USB slots or how many watts the stereo has. For them it's about bills, bills, bills; residual values, fuel economy, carbon dioxide emissions, insurance costs, servicing overhead and so on. The Passat looks like it's getting off on the right foot. Go for the 1.6-litre TDI BlueMotion diesel model and your combined cycle fuel economy could be as high as 74.3mpg, while your CO2 return would be rated at a tax-busting 96g/km of CO2: pretty good for a large estate. Even the pokier 2.0-litre TD 150PS model manages 67.3mpg and 112g/km. The cleanest option is the GTE Plug-in hybrid version, which can record CO2 emissions of just 40g/km. Aggressive pricing sees the Passat square up more or less head on with tackle like the Vauxhall Insignia and engine for engine, the Passat is a good deal more economical and cleaner to boot. Pull residual values into the equation and the Passat wins hands down. If you�re looking for a new Volkswagen Passat 2.0 TDI SE Business 5dr Diesel Estate for sale, you�ve come to the right place. 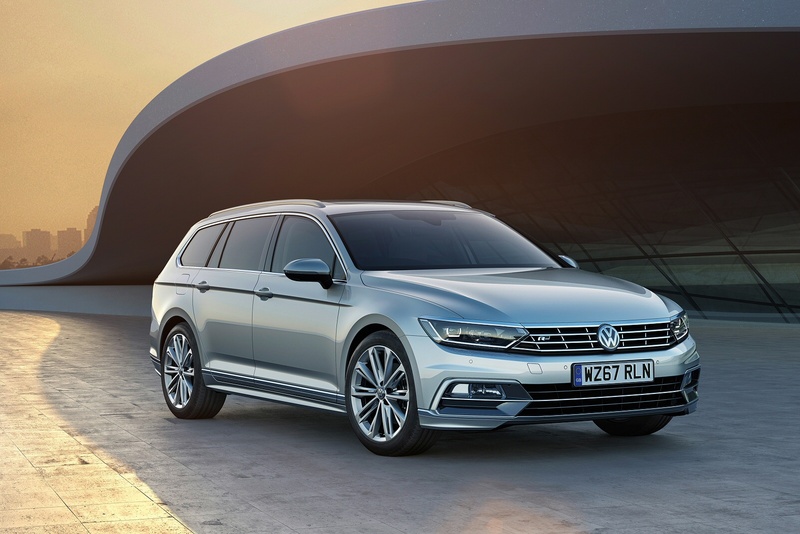 At Bristol Street Motors we don�t just have the best Volkswagen Passat 2.0 TDI SE Business 5dr Diesel Estate deals, we also offer friendly advice and help with all your enquiries to ensure your buying experience is a happy experience.